Mortimer Glum’s Mystery Cover unveiled. New contest! A few months back, we set Mortimer Glum free to create anything he wanted for a limited-edition Mystery Cover. No rules. No restrictions. 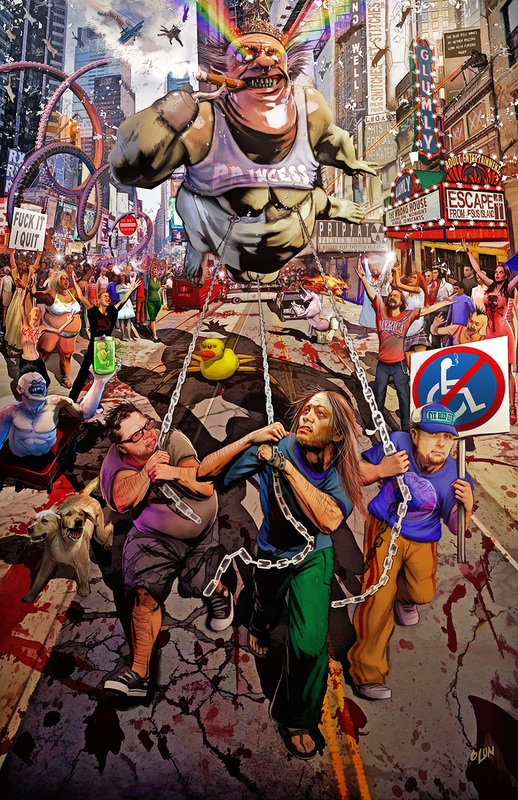 That horrific image has only been seen (and can never be unseen) by those who pre-ordered one of the 50 copies of this book in existence… until now. Behold, Mortimer Glum’s EFJI#2 Mystery Cover! WANT A MYSTERY COVER? We only printed 50 of these limited-edition books ever and they come signed by Mortimer Glum and writer Shawn French. We only have a couple left. You can snag yours for $25 + $4 US shipping. Drop me a note at JesusIslandComics@gmail.com to get one of the final copies. Those who pre-ordered the Mystery Cover also got to take part in a little puzzle that Morty hid in the details of this freakshow on parade. Daniel Zubek from Illinois won the top prize, but now we’re going to open up this puzzle to the rest of you. NEW CONTEST! THE CHALLENGE: Hidden somewhere in the twisted depths of the Mystery Cover is a question. The answer to that question can also be found in the image. DEADLINE: Entries must be received by March 8 at midnight EST. 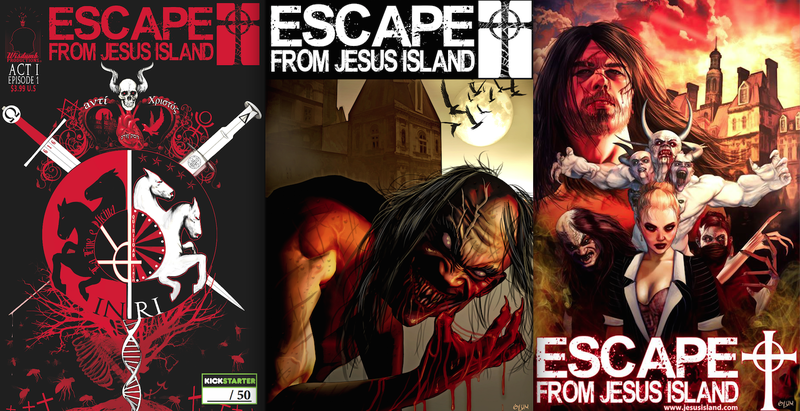 THE PRIZE: One winner will be randomly selected from among correct entries and will receive an 11×17 Escape From Jesus Island poster. Your choice of six designs, each hand signed by Mortimer Glum. ← Happy New Year from EFJI! Pingback: EFJI: Glum’s Mystery Cover New Contest! – Give Us Art!